Daniel Foster | Tue, September 12, 2006 | Misc. Dale Pritchett recently completed the final leg of the Bible Road Trip. Read previous posts and view photos from the Road Trip. Now that we are home in Bellingham, I decided to go back and fill in some of the blanks and tell you more about our experiences on the road. Well, it turns out that some passing trucker used his own mirror to take out our mirror. Since “our mirror” is some fancy one-of-a-kind, made for the RV mirror, we would have to wait a week for the replacement. In the mean time we had to “make do” with a cheap vanity mirror John had cleverly duct taped to the shattered mirror mount. Every hour or so we would pull over and adjust the tape, and attempt to reduce the weathervane tendencies. 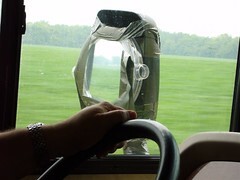 Since the vanity mirror did not include the additional convex mirror normal on an RV, we could only see our blind spot when wind forced the mirror to vibrate left and right thereby momentarily increasing our field of view. Ya’ gotta love that vibration. The blind spot on the Starship Enterprise could easily conceal a formation of six Harley riders, a state trooper and perhaps a small traveling carnival. But all this is just to see the road and what a road we had to see. The entire state of Michigan appeared to be celebrating “road reconstruction month” with special emphasis being given to single lane merges on three lane expressways and temporary single lane bridges. Such were the joys and terrors of our first full day in the RV. Once in Grand Rapids we parked the RV and considered the option of abandoning it and taking a cab back to Bellingham. But relief came in the form of Jim and Karolyn Van Noord, parents of James Van Noord, one of our Logos programmers. Jim picked us up at the campground in a normal car. We had a wonderful, relaxing evening at a great restaurant, followed by a tour of Grand Rapids. It was just what we needed.